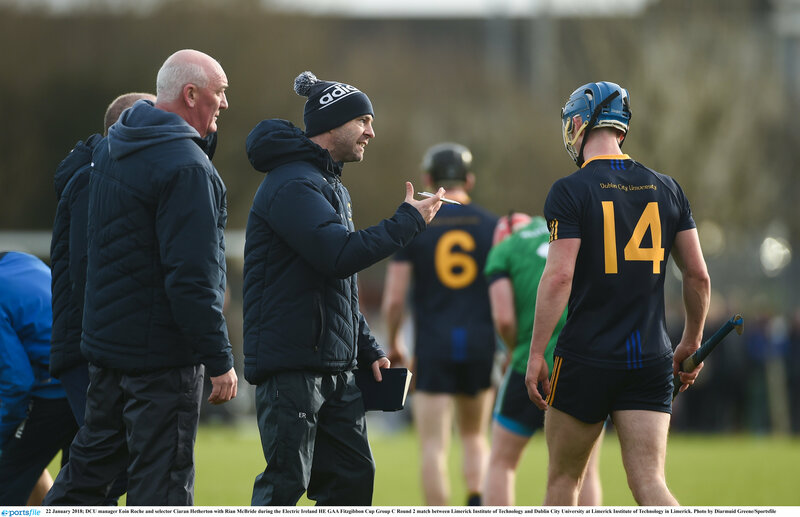 DCU fired off two late points in stoppage time to see off the challenge of last years’ Fitzgibbon Cup champions Mary Immaculate College in St Claire’s last Wednesday evening. Dublin’s Donal Burke started off DCU account with a well taken free near the clubhouse side of the pitch, but disaster struck for DCU moments later, when Clare comrades Gary Cooney and Michael O’Loughlin combined for Mary I’s opening goal. Cooney soloed through a very opening DCU defence before hand-passing it to O’Loughlin who couldn’t miss one on one with DCU skipper Oisin Foley at close range. DCU scored the next three points in a row with Burke pointing brilliantly from frees to give DCU back the lead at four points to a goal. Mary I goal scorer O’Loughlin followed up his initial effort with a confident free with corner forward Brian Corry chipping in a nice point from play just inside the 45. Mary I could have ran away with the half moments later as Gary Cooney was in on goal, but his effort went agonisingly right of the post and wide. DCU full forward Rian McBride then hit a huge point from the side-line on the 45 to put the sides all square at 1-2 to 0-5. Burke and O’Loughlin then traded frees before DCU’s first goal chance. McBride won a high ball in the square but valiant Mary I defending stopped the danger. Kilkenny kingpin Conor Delaney stepped up to provide one on the plays of the game, hitting a colossal point on the run from the centre of the pitch for the home side. A Burke beauty followed Delaney’s effort as Burke won the sliotar, turned and let fly from the side line with a snapshot. DCU lead the challengers 0-8 to 1-3 at the break. The second half got underway with substitute Killian Doyle scoring for DCU. Gary Cooney led the challenge for the challengers again in the second half as he popped a nice shot over from 40 yards out. Limerick hotshot Cian Lynch kept Mary I in check with a lovely shot from out the field. They now trailed by a point at 0-9 to 1-4. As DCU struggled to get through a high intensity Limerick defence up came Kilkenny corner back Darren Mullen who chipped over a nice score from a very tight angle near the end line. DCU started to get into their stride as Wexford’s Joe O’Connor pinged over a beauty from the clubhouse side line near the 45. O’Loughlin chipped over a free for the challengers. However, DCU rallied and got the next three scores on the trot. Burke hit over a point on the turn before midfielder O’Connor showed his class with an identical point to his first an another after a DCU turnover on the 45. O’Loughlin sent over another free for the challengers, but in the next play Burke hit the side netting to deny DCU a game winning goal. Mary I came roaring back into the contest as a hopeful high ball was won in the square by substitute Colin Guilfoyle who was fouled by full back Eoghan O Donnell. Eoghan Cahill came up from goals and slotted the resulting penalty to the top left-hand corner of the net to leave a point between them at 2-7 to 0-14. Cian Lynch from near his own 65 levelled it for Mary I with a monstrous point. The challengers took the initiative courtesy of corner back Colm Stapleton who fired a nice point over on the run into the DCU 45. DCU kept their composure and Deise dynamo Patrick Curran got the home side level again. Killian Doyle added to Currans effort to put DCU a point the better. O’Loughlin stood up to bring Mary I back on level terms in what was an extremely tense and exhilarating closing stages. But what O’Loughlin could do so could Burke. The Dublin forward pushed DCU ahead by a pointed free. McBride added to Burke’s free with a nice point from the ‘D’. Mary I immediately responded as Cork County star Luke Meade cut inside DCU defenders to hit a good point from 35 yards out. Mary I levelled up matters once again as Cooney hit a cracking effort from the side line as extra time loomed. DCU finished the stronger though. Killian Doyle hit over a point at close range to give DCU the lead and a goalie error handed Jack Lacey a point at the death to give DCU a two-point victory. DCU scorers: Donal Burke 0-8 (0-6f), Joe O’Connor 0-3, Darren Mullen 0-1, Conor Delaney 0-1, Killian Doyle 0-3, Patrick Curran 0-1, Rian McBride 0-2, Jack Lacey 0-1. Mary I scorers: Eoghan Cahill 1-0 (1-0P), Michael O’Loughlin 1-5 (0-5f), Gary Cooney 0-2, Colm Stapleton 0-1, Cian Lynch 0-2, Brian Corry 0-1, Luke Meade 0-1.